A Close Reading of Emily Dickinson's "I Taste a Liquor Never Brewed"
When Butterflies — renounce their "drams"
A close reading of "I taste a liquor never brewed" (above) reveals that it demonstrates many of the Dickinsonian elements that we are learning about in my Modern & Contemporary American Poetry class. We will begin by looking at the meaning of key lines in the poem. Then we will detail how the use of form, metaphor, and openness work together to deliver a powerful message to the reader. First, we will look at a basic analysis of the language and primary meaning in the poem. The mention of "Tankards … and Vats upon the Rhine" not being able to measure up to her liquor shows the enormity of what she is imbibing. She is saying that even large quantities of the best German beers do not match what she is holding. She is also saying that what she holds currently can exceed in essence even what has been brewed in the past. The mention of "inns of Molten Blue" in the second stanza changes things. It now appears that she may not be drinking an actual beverage, but drinking in the blue sky and the great outdoors (more on this later). The word "Foxglove" carries forward this double-meaning. It is a flower that she encounters in the meadow, but also the name of an inn. She is drawing a parallel between soaking in the great outdoors and drinking in a pub. The bees and butterflies are getting drunk on nectar. "Landlords" turning them "Out of the Foxglove's door" evokes drunks being kicked out of the bar. Finally, she carries the poem high into the ethereal sky where she is so inebriated that she is drunkenly floating past Angels atop mountains ("Seraphs swing their snowy hats"), and she is so high that she is practically touching the sun. The form of the poem shows many of the classical Dickinsonian constructs. She uses dashes to represent the openness of the outdoors. Her brevity allows for the multiple interpretations that allow the reader to be simultaneously witnessing a scene in a pub and one in an outdoor meadow. She also uses parataxis ("to windows run"), dashes (pauses), and shortened words ("thro", "drams") to show the progression of the inebriation throughout the course of the poem. The phrases become shorter as the poem goes on, making the reader feel that she is becoming a bit inebriated as well. Finally, "Leaning against the - Sun -" feels like a final triumphant utterance before collapsing to the table, completely drunk. Even in the simple analysis we have done, it is impossible to ignore the two levels of metaphor that Dickinson is presenting. The first is enjoyment of the outdoors as a metaphor for drinking in a pub. She pulls this off brilliantly through the use of terms that apply to both (including "Inebriate of air", "Foxglove's door", and "drunken Bee"). As you read the poem, you feel as if you are in both places at the same time. The higher-level metaphor is the liquor representing the text of the poem, and the inebriation as the enjoyment of the poem. It is not immediately clear whether the word "taste" refers to the writing of the poem or the reading of it. In my opinion, Dickinson is the one doing the tasting. This is in line with her other poems, where she speaks of experiencing the entirety of the world alone in her closed room. She is actually creating the "liquor never brewed", and it is the text of this poem that we are reading. As in most Dickinson poems, this meta-poetic interpretation is clearly intended and not difficult to discover. Of course, an alternate interpretation is that the hard work of interpreting this poem is the "tasting", and we are becoming drunk as we decipher the layers of meaning in the poem. It can be left to the reader which of these two interpretations apply. As in many of her poems, Dickinson uses some irony to show that she is aware of the enormity of what she accomplishes in this poem. We can see this in the lines "And Saints - to windows run - To see the little Tippler". She is the little Tippler. And the word "little" is ironic here, because it takes something pretty significant for Saints to stop their devotion to God and run over to a window to look up at someone. She knows that there is nothing little about what she has accomplished here. And she drives this point home by noting that she is so powerful in creating these words that she can essentially touch the sun. 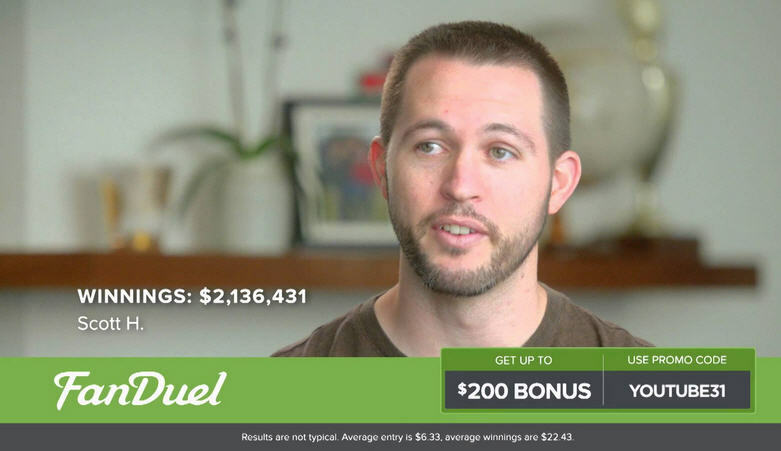 You've probably seen a lot of commercials recently for gambling sites like DraftKings and FanDuel. They include testimonials like the one above where an ordinary guy won $2.1 million dollars. When you add it all up, it seems like people have won impossible amounts of money from these sites. One commercial I saw said the site has given out over $2 Billion in winnings! How is that possible? In this article, I will attempt to explain what I think is going on here. Initially, I was drawn to the prospect of winning $1 Million in one of these big contests. I wanted to be like the guy in the commercial, hugging all of his friends after his team presumably stopped some opposing player from gaining a yard on the final play of the game. I quickly realized that these games are a waste of time, because they are a lot like entering the NCAA pool. You pay a small amount to enter (say $5) and compete against a million other people. It only takes about an hour after the games start for you to realize that you are not going to be winning this lottery. But then I noticed something interesting. They have these smaller games you can play, where it is much easier to win. There is a golf game, for example, where there are 36 people who enter each game, and if you finish in the top 12 you get double your money back. I'm actually pretty knowledgeable about golf and won this game a few times. (My initial investment of $25 is actually back up to $23 now.) Alert the IRS! So what is my point? Well, in total I've actually lost about $30 on these games and won $28. So the site can say that I have $28 in "winnings". Now imagine the guy with $20,000 in his account who wins and loses an average of $3,000 each week. He might break even over the course of the year, but his "winnings" are $150,000. Multiple that by half a million people and these numbers stack up pretty quickly. Is it surprising that a site can give out over $1 Billion in "winnings"? Hardly. But what they don't tell you is what the net winnings are . Of course, the site takes a small percentage every time someone loses and someone else wins. Is it possible that the guy shown above won $2.1 Million? If he has an account with $100K in it and wins $20,000 per week, he could reach this staggering total after about 2 years. But it doesn't mean he has any more money in his account than when he started. I ordered a USB 2.0 to Ethernet Adapter. It was a bit tricky to get working. 2. Downloaded the CD files that are provided in the link on the Monoprice site, but I had several issues with those files and could not get them working. 3. Went to the ASIX driver download page and downloaded the "Windows 7 64 bit" driver. 4. Went into Windows Device Manager as administrator and saw "Unknown Device". Note: It does not flash the little green and yellow lights, so if you don't see the lights do not assume that it is not working. Go to speedtest.net and see how fast your connection is.